Activist and documentary filmmaker explains the situation of the 'Bridge Over Biloxi'. Two days ago, the Biloxi River rose quickly due to heavy rainfall. Local employee of a business on the Biloxi side had to call a friend with a truck to evacuate her due to street flooding on the Biloxi side. If The Bridge was open, even just to small traffic, she could have just driven over The Bridge to the Gulfport side, which has higher elevation. Lorraine Road bridge closed until further notice. City engineers in Gulfport and Biloxi reviewed the condition of the bridge and decided it should be closed Monday at 2 p.m., cutting off businesses from its customers and forcing drivers who normally use the bridge to detour for miles. They can take Mississippi 605 north to Three Rivers Road on the west side of the bridge or use the Woolmarket exit off Interstate 10 to the east. The bridge will remain closed until an in-depth safety analysis is done on the bridge's substructure, including underwater, Biloxi and Gulfport said Monday in press releases. In May an inspection of the bridge was performed by engineers for the Mississippi State Aid office. "It was noted from this inspection in a report that at least two of the bents are leaning," Gulfport's press release said. Gulfport said closure may be temporary if the inspections indicate it is safe to reopen. 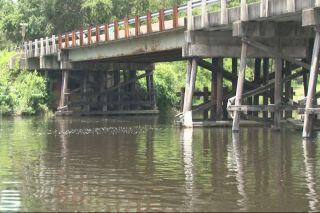 The state said the bridge has a sufficiency rating of 27.8 out of 100, and the weight limit is 30,000 pounds. This means some school buses and large trucks shouldn't use the bridge. According to the Mississippi Department of Transportation, about 4,800 cars cross the bridge each day. Gulf Regional Planning Commission estimates 3,600 vehicles a day cross the two-lane bridge. School buses and those who drive to school also will have to use an alternate route starting next week if the bridge isn't reopened. Gulf Regional Planning Commission was prepared to contribute $3 million to replace the bridge last year, if Biloxi, Gulfport and Harrison County committed in writing to share the remaining cost of about $6 million. Biloxi and Harrison agreed to split the cost into thirds, but Gulfport officials said the new bridge would be more in Biloxi and said it would only spend $900,000.